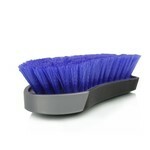 When spills and accidents ruin your clean car carpet, reach for the Professional Interior Induro Brush! The professional-grade Induro Brush is made with a rugged rubberized handle, durable PVC brush body, and versatile nylon scrubbing bristles. Mist some Chemical Guys Nonsense or Lightning Fast Carpet Cleaner over dirty floor mats, and gently scrub with the Induro Brush to break down fresh and set-in stains. 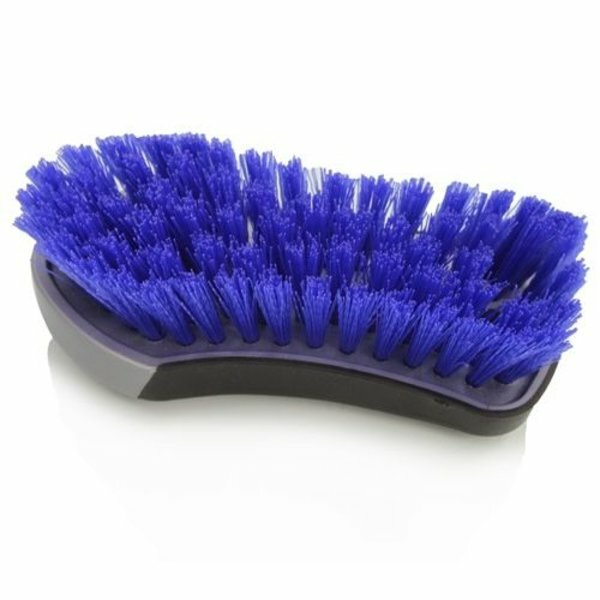 The stiff bristles have enough grunt to agitate dirt and grime from deep within carpets, fabrics, and floor mats, but give enough to gently clean leather, vinyl, and other sensitive upholstery materials. The full-synthetic brush design is safe for use with any Chemical Guys carpet cleaner, fabric cleaner, all purpose cleaner, or heavy duty degreaser for cleaning intense messes and filth. Use the versatile brush on fabrics and carpets found throughout car interiors, around the home, in the office, and even on tile, grout, and concrete surfaces like garage floors and driveways. The forward-raked bristles, spade-shaped contour, and easy-grip brush handle give this brush immense leverage. One stroke with the Professional Induro Brush is equivalent to a dozen passes of cheaper brushes. Take a look inside any professional detailer 's interior caddy, and chances are you 'll find an Induro Brush! Find out why the professionals choose their tools first hand, and pick up the Induro Interior Detailing Brush today! Professionals have turned to the Professional Interior Induro Brush for years because of its rugged design and versatile performance. Detailers routinely start interior cleaning jobs by loosening stuck-in dirt, grime, and sand from deep within carpets and upholstery for better vacuuming results. Physical agitation is the secret to breaking up stains and releasing the dirt stuck inside tangled carpet and fabric fibers. Scrubbing with the Induro Interior Brush agitates filth and grime from deep within fabrics for a thorough cleaning job that is not possible otherwise. Preparing fabrics with physical scrubbing with an all-purpose cleaner is the perfect set up for the best release of dirt and grime with a hot water detailing extractor. This single brush is one of the most powerful tools in any detailing professional 's arsenal. Choose the Professional Induro Interior Detailing Brush when cleaning intense filth, grime, and stains from car interiors and fabrics around the home. The Professional Interior Induro Brush was not designed just for good looks; it 's a functional piece of detailing equipment. The comfortable handle conforms to the hand while the front-raked bristles increase leverage with every push of the brush. These two tweaks to traditional brush designs empower any detailer to take down any stubborn stains and filth set deep into carpets and upholstery. Full-synthetic brush construction preserves the tool against detailing chemicals and cleaners for full compatibility in any detailer 's arsenal. 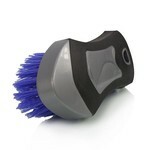 Easily scrub carpets, fabrics, and upholstery in, around, and outside of any vehicle with the Induro Brush. The versatile cleaning shape gives power and leverage when cleaning any type of surface, including rubber floor mats, concrete floors, tile, grout, and leather upholstery. Keep one for car interiors and one for inside the house, and clean up any mess with your new favorite brush: The Professional Interior Induro Brush! The Chemical Guys Induro Interior Brush works best with your favorite Chemical Guys all-purpose cleaner or heavy-duty stain extractor. For general carpet cleaning, try using Chemical Guys Nonsense. Nonsense is a colorless and odorless all-purpose cleaner that works wonders on upholstery, fabric, and carpet. Dilute Nonsense 20:1 for general interior cleaning jobs, or up to 10:1 for heavy duty stains and grime. If Nonsense can 't take down the stains, try switching to Chemical Guys Lightning Fast Stain Extractor. Lightning Fast breaks down set in stains and releases them from deep within carpets and fabric. Lightning Fast is very strong, so dilute it 20:1 before use on carpets or floor mats. 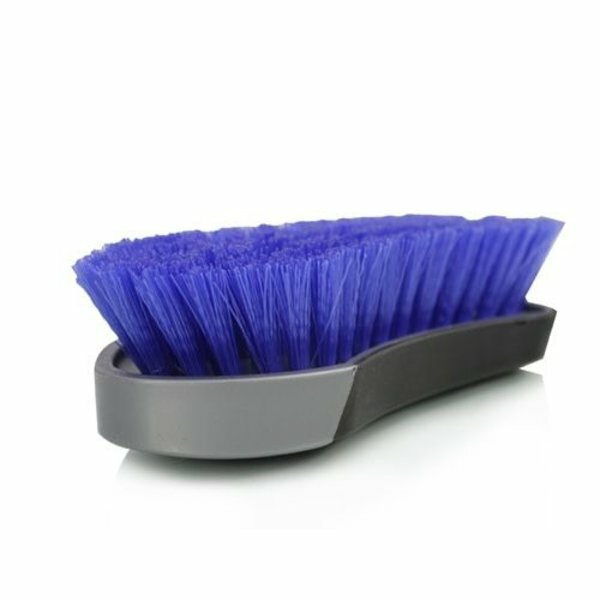 Simply mist a few sprays of your favorite cleaner on the carpet or floor mat, let sink in for a few seconds, then scrub and agitate the area with the Induro Brush. Scrub back and forth, then side to side with the brush to loosen dirt, debris, and stains, then draw them to the surface of the cleaner. Wipe up and blot the loosened debris with a microfiber or terrycloth towel. For best results, use the Induro Interior Brush during the pre-treatment stages before using a hot water detail extractor to vacuum out every bit of dirt and debris with hot water. How To Use:Determine the least-aggressive combination of brush and cleaner to get desired results on your carpet. Mist a discrete portion of the piece with a 20:1 dilution of Nonsense All Purpose Cleaner to check for desired results, then scrub with the Induro Brush. If the 20:1 dilution did not produce satisfactory results, try 10:1. If more stain extraction power is required, try using Lightning Fast Stain Extractor undiluted. Scrub the stains and debris front to back, then side to side. Wipe up residue with a clean microfiber or terrycloth towel. For best results, use a hot water detail extractor to fully remove embedded debris. reat the area with Fabric Guard for extended protection against spills and stains.